Part Elf: Michael thinks it would be no fun getting stuck in a log cabin all winter with Kimi Raikkonen. I have to say Japan is a strange country and the people also, are strange. Of course at the same time they are very nice. And I am honestly not saying this simply because of our longtime partnership with Bridgestone who are the biggest bunch of great guys you could wish to meet in a pit garage. When I won my fifth (World Driver's) title at Magny Cours, it was the Bridgestone tyre crew who carried me on top of their heads up and down the paddock. I received a greet feeling for them to do this and as I think I wrote before - I was touched all over. No, it is ordinary Japanese people in the street who can give you a strange and interesting experience. Before the race Sabine let me off my "Hello, how are you?" duties for an hour to go shopping in Tokyo. As normal I was wearing my 5 World Championships cap with the five gold stars. Two Japanese schoolgirls stopped in front of me. Looked at me. Pointed at my cap and giggled. They obviously recognized me as Schumacher-san - very fast F1 pilot. "Look," said one pointing at the cap, "boss of McDonalds!" I also have to tell you that Takuma is a great additional to the Grand Prix Drivers Association. He has been giving us several laughs with some of the funny things he is saying in English this year. 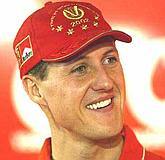 After the race is finished at Suzuka he said, "fans are exciting so much, all race." I'm sure he is not intending to sound quite so comic, but obviously a fun person to have in any race. It is better to listen to him than to Kimi Raikkonen. Quite honestly at press conferences I feel like I am doing a community visit to an institute for people with head problems when I am listening to him speak. What is it with this guy? He has finished third in a race and he is sounding like someone who has been locked in a log cabin with a moose all winter. I have witnessed his girlfriend and she is a very gorgeous. This does not make sense. What does she see in a guy who makes even Ron Dennis sound like the world's most interesting man. He is not even funny. And certainly not 70% funnier in 2002. As you might have seen, the Japanese Grand Prix was another good Scuderia race, even though our beloved big guy, Ross The Boss, was not with us to share our ultimate season triumph. Nine 1-2 finishes, 15 wins, 12 wins for me (11 of them official), more points than all the rest of the grid assembled in one place. And another fine trophy for Frau Blucher to dust in the trophy room! - since the last race I have told her we absolutely cannot go down that road of not winning races. She leaves us in February and there are no races till then. Sure I will win various sportsman of the year awards, man of the year awards, driver of the year awards from magazines such as Autosport and F1 Racing, and of course the FIA awards in Paris, but I can hardly be expected to slow down and let someone else win them! She will have to cart her moaning old Swiss bones round the trophy room and do some work. It is not as though we are not paying her money for this. Ross was at home in England with his continuing bad back, and so we are providing to him a video of what we are doing all the time so he can play Big Brothers. There was a camera attached in our garage that we can point and show him things. After the race, everyone in the team is getting excited and celebrating like crazy. To a point where some of the more excited members of the team are showing the moon to Ross down the video camera link! I guess it is not so nice to see a number of hairy bottoms down a video camera. Even if they are Scuderia Marlboro Ferrari bottoms. However even in these matters Ross is always 100% correct. The one with all the bite marks he correctly guessed as Jean Todt's.